The Indian government has tried to count the number of "illegal Bangladeshi immigrants' and failed. Most Bengali-speaking Muslims in Assam and Bengal have a history going back to the 1860s. The "illegal Bangladeshi immigrant" is a major part of the cycle of violence and politics in Assam and is threatening to engulf West Bengal too. But just who is the "illegal Bangladeshi immigrant"? There are no focused studies and no reliable data. That is why hypothetical figures and random estimates are easily deployed as fact in the service of politics and ethnic violence. How and when did the figure of the "illegal Bangladeshi immigrant" come to prevail in the popular imagination as a threat to national security and integration of the country? 1826: The history of Bengali-speaking Muslim migrants into the North East from East Bengal – which later became East Pakistan and then Bangladesh – is an old one. After the Treaty of Yandaboo in 1826, colonial officers viewed annexed Assam as a “dreary and desolate wilderness” and decided that “four millions immigrants should be received and settled in the province” to further the old colonial goal of maximising revenues. Special officers were appointed just to oversee this migration of labour. 1871: The migrations radically altered the demography of the region as people from densely populated East Bengal districts such as Myamansingh, Dhaka, Pabna were settled in Assam. The 1871 census recorded major changes in Assam districts such as Goalpara, Nowgong, Darrang and Kamrup. 1930s: Migration subsequently intensified the competition for resources among different ethnic groups. Before 1947, provincial governments headed by Sayeed Mohammed Saadullah and Gopinath Bordoloi attempted to protect tribal land using the Line System, which drew an imaginary line between the lands of tribals and immigrants. The All India Muslim League pressed for its abolition. In 1939, the Saadulah government opened up grazing reserves to settle immigrants under a “grow more food” campaign (which Viceroy of India Lord Wavell said meant "Grow More Muslims"). The British policy of divide and rule was in full play. 1947: Serious changes in the area's demographic composition and the threat to tribal land was acknowledged when in 1947 tribal belts were created by an amendment of The Assam Land and Revenues Regulation of 1886. The Gopinath Bordoloi established 46 tribal blocks, covering an area of 16,75,946 hectares. The rules also allowed the government to resettle people displaced by natural disasters like floods and earthquakes and land acquisition. Muslim cultivators who had settled in the "char", or river islands, and "chaporis" (low-lying flood-prone areas) were the biggest beneficiaries of this provision. 1951: The 1951 census estimated the number of migrants from East Bengal at around one million to 1.5 million – between one-tenth to one-sixth of the total population of the state. Of the 1.1 million acres of wasteland inhabited by migrants in Assam, nearly half a million acres was being farmed by East Bengal settlers. These immigrants, and their descendents, are neither illegal nor Bangladeshi. 1948-1961: According to the Indian Home Ministry, about 3.1 million persons, mainly Hindus, migrated from East Pakistan from 1948 to 1961. The chief minister of Assam of that time, BP Chaliha, spoke about the influx of nearly 1,80,000 refugees from East Pakistan to Assam between January, 1964 and January, 1965. 1971: In Assam, Tripura and West Bengal, the flow of Bengali migration continued after Partition. The population flow into North East India during the 1971 Bangladesh liberation war complicated the binaries of "migrant" and "refugee" because the majority of Bengali Muslims entered India to avoid political persecution by the Pakistani forces, not to find jobs. 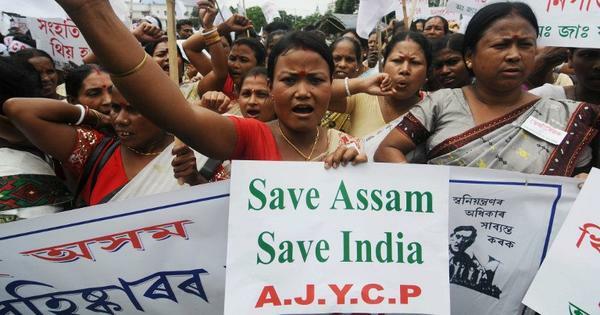 The Assam Accord of 1985 between the central government and Assamese agitators fixed 1971 as the cut-off year to detect and deport illegal Bangladeshi immigrants. As opposed to this complex history outlined above, let us see what politicians say. 1) Indrajit Gupta, the Home Minister of India, said in the Parliament in 1997, in the first official statement of this kind, that there were 10 million illegal migrants in India. Quoting a Home Ministry source, India Today magazine the next year provided a statewise breakdown: West Bengal 5.4 million, Assam 4 million, Tripura 8 million, Bihar 0.5 million, Maharashtra 0.5 million, Rajasthan 0.5 million and Delhi 0.3 million, making a total of 10.83 million. 2) In the same year, Assam Governor, Lieutenant General (Retd) SK Sinha, warned in a report to the President that the illegal Bangladeshi influx "poses a grave threat both to the identity of the Assamese people and to our national security” and that “large-scale illegal migration from East Pakistan/Bangladesh over several decades has been altering the demographic complexion of this State." However, the report was candid in admitting that “no census has been carried out to determine the number of these illegal migrants. Precise and authentic figures are not available but on the basis of estimates, extrapolations and various indicators, their number runs into millions." 3) In 2001, a report by the Task Force on Border Management headed by Madhav Godbole put the figure of illegal Bangladeshi immigrants at 15 million, with 300,000 entering India illegally every month. In January 2003, deputy prime minister Lal Krishna Advani issued a national directive to all states to take "immediate step to identify irregular Bangladeshis, locate them, and throw them out". Minister of State for Home Affairs Prakash Jaiswal in 2004 told the Rajya Sabha that there were 1,20,53,950 illegal Bangladeshis in India. According to these figures, the number for Assam was 5 million, West Bengal 5.7 million, followed by Bihar at 4.7 million and Delhi at 3.75 million. 4) If one were to go by the Home Ministry estimates, the increase in the number of illegal Bangladeshi migrants is much lower than the previous figures. This report also explicitly states that “the reported figures were not based on any comprehensive or sample study but were based on hearsay and that too from interested parties. Therefore, no realistic figures can be given for illegal Bangladeshis in Assam. In the case of West Bengal also, the figures are based on unreliable estimates and are incorrect.” This admission is symptomatic of most official statements on the issue of illegal immigration. 5) It was admitted in Rajya Sabha in 2007 that “according to available reports”, Bangladeshi nationals have been using the porous Indo-Bangladesh border to enter into India illegally but it has also been clarified that it is difficult to make a realistic estimate about the number of such illegal Bangladeshi immigrants “because they enter surreptitiously and are able to mingle easily with the local population due to ethnic and linguistic similarities”. 6) A white paper on the issue of illegal immigration in October 2012 published by the Assam Government states that various tribunals have since 1985 declared 61,774 persons as foreigners. Of them, 32,537 persons are, as per the Assam Accord, to be gradually registered as Indian citizens. These difficulties of state and central governments in identifying and quantifying "illegal Bangladeshi immigrants", when seen against the long history of Bengali-speaking Muslims migrating from what was once a part of India to another part of India, suggests that the "illegal Bangladeshi immigrant" is more a political bogey than a serious large-scale threat to India.